Still deciding how to show your valentine they're worth more than their weight in gold? Express just how much you care with lavish offerings from Trump International Hotel & Tower Toronto®. The hotel is making it easy to spoil your sweetie with a variety of lavish offerings crafted in honour of Cupid's special day. From indulgent gift baskets replete with goodies from at STOCK™ Restaurant Bar & Lounge and Quartz Crystal Spa™ to hotel stays and dinner options for two, Trump International Hotel & Tower Toronto has something exceptional to create the most romantic experience for everyone. Set the tone for an amourous evening with fine dining at the Four Diamond rated STOCK Restaurant. Chef Todd Clarmo has upped the ante with a special Valentine's menu available from February 14 - 16, 2013. Those dining on February 14th will enjoy a complimentary glass of sparkling rosé. Menu highlights are meals for two including options such as the 'STOCK Raw for 2' starter (a trio of burrata and prosciutto, blue crab guacamole and tuna tacos) and a main of whole Turbot accompanied by Yukon frites, French green salad and salsa verde. Pastry Chef David Chow has created three additions to the dessert menu to cap the meal off. The 'Chocolate Dome' (whipped ganache, nougatine, passion fruit sorbet, and tonka bean caramel), Vacherin (raspberry sorbet, vanilla parfait, pink peppercorn meringue, mascarpone chantilly) and 'Chocolate Fondue For Two' (dark, milk or white Valhorna chocolate dipped with accompaniments like strawberries, bananas, beignets, cookies, double smoked bacon, pound cake and marshmallows) will set the mood for the rest of the night. For reservations, call 416.201.4119 or visit www.stockrestaurant.com/reservations. Pull out all the stops with this ultimate Valentine's stay package and you can expect your sweetheart to be thanking you forever. The offer is valid from February 8 - 16, 2013 and includes: Overnight accommodation, one dozen long stemmed roses, chocolate covered strawberries, a personalized greeting note card, $150 credit for dinner at STOCK Restaurant, and a couples massage at the hotel's world class, Quartz Crystal Spa. Prices start at $926 CAD per night. For reservations, call (855) 88.TRUMP (87867) or visit www.TrumpTorontoHotel.com. Throughout February, treat your special someone to the ultimate urban escape with one of Quartz Crystal Spa's Valentine's offers - Give the gift of a 50-minute Swedish Massage and receive an express manicure for $150.00, a Quartz Crystal Spa Manicure and Pedicure and receive a Quartz Opulent Hand Crème for $160.00, or a Quartz Crystal Spa Signature Facial and receive a complimentary oxygen boost for $155.00. 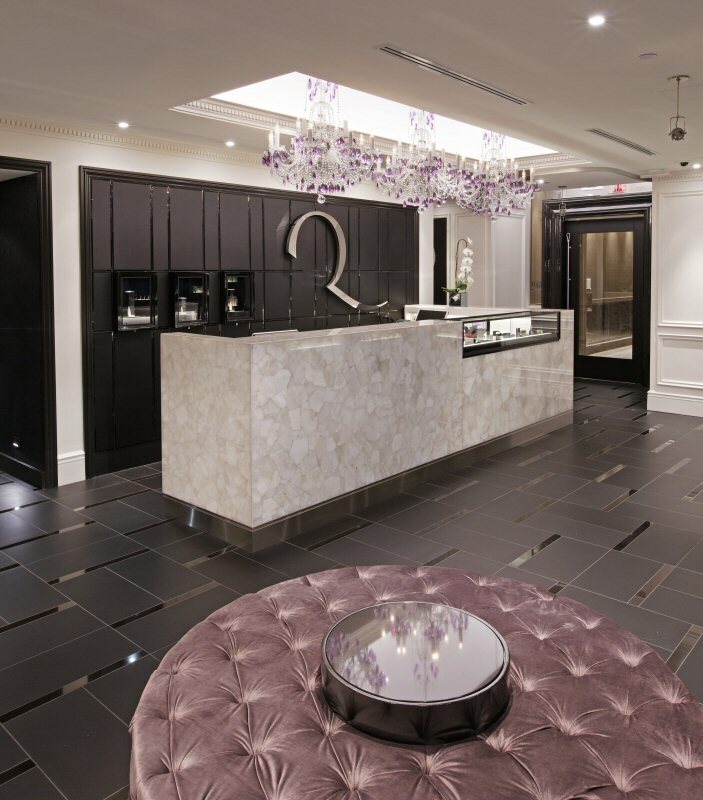 For reservations, call 416.637.5050 or visit quartzcrystalspa.com/reservations. The Pamper Your Valentine ($295) gift comes with Signature Quartz Crystal Spa products including Frankincense and Myrrh Tension Balm, Bio Silk Body Lotion, Bacio d'Aqua Body Wash and Opulent Hand Cream. The package is sweetened with heart shaped meringues and a chocolate lollipop kiss, as well as a plush Quartz Crystal Spa bathrobe and a gift card towards any treatment at the spa. The From the Heart ($95) basket is overflowing with the highest quality chocolates from STOCK's Chocolate Lab including a four-piece box of artisanal truffles and bonbons, the Chef's Choice chocolate bar creation, toffee, a chocolate lollipop kiss, heart shaped meringues and a deluxe vial of truffle oil. A Night In ($195) comes complete with a four-piece box of artisanal truffles and bonbons, the Chef's Choice chocolate bar creation, toffee, a chocolate lollipop kiss, heart shaped meringues, truffle filled chocolate heart, beautiful truffle salt and oil, two recipe cards from STOCK's pastry and executive chefs, and a gift card for Chocolate Fondue for Two at SUITS Lobby Lounge or STOCK Restaurant. To order a gift basket or gift card, call 416.201.4119, email gifts@stockrestaurant.com, or visit https://www.stockrestaurant.com/gift_collection. Surprise your loved one with the gift of luxury. The lucky recipient of a Trump gift card may enjoy luxury accommodations, dine at our award-winning restaurant or be pampered at the most luxurious spa oasis in the city. It is a foolproof way to express your adoration. Gift cards are available in any denomination from $50 and can be customized with your personal message. In addition, purchases of Quartz Crystal Spa gift cards worth $250 or more will come complete with a Quartz Signature Hand Cream (valued at $48) through February 14, 2013. For hotel and dining reservations, to purchase a Trump hotel or spa gift card or for more information, please contact (855) 88.TRUMP (87867) or visit www.TrumpTorontoHotel.com. Dining and spa reservations are highly recommended. To view the photo associated with this release, please visit the following link: www.marketwire.com/library/20130211-trump0211px800.jpg. Spoil your sweetheart with Valentine's offers from Quartz Crystal Spa, the ultimate urban escape at Trump International Hotel & Tower Toronto.